“We have so many community members interested in being involved already and we have only just begun,” Michele Crowl says of The Rivet, seen in an artist’s rendering. A community makerspace called The Rivet is coming to life at Discovery Space on North Atherton Street. The Rivet’s construction, getting under way this spring, is spurred by the maker movement sweeping the country as a do-it-yourself lifestyle. There have been a number of conversations in the community over the past six years about starting a large community workshop and makerspace in the area, Discovery Space leaders say. Michele Crowl, executive director of Discovery Space, has led that conversation for the past 14 months. Discovery Space moved from downtown State College to a bigger home at 1224 North Atherton Street in the fall of 2017, but initially rented only two-thirds of the facility. In February 2018, Crowl invited the community to a meeting to discuss the potential for creating a makerspace using the unrented 5,000-square-foot garage bays at the back of the building. The project got a major boost in November, winning the Centre Foundation’s Centre Inspires $100,000 grant. The garages will be renovated to include space and machinery for woodworking, metal working, laser and vinyl cutting, pottery, 3-D printing, electronics, computer programming, and more. The makerspace will offer a safe work environment for people ages 14 and older. By making the space available to the public, Discovery Space hopes to aid those building new things or testing newly invented products. “We have so many community members interested in being involved already and we have only just begun,” Crowl says. The Rivet is part of the nonprofit Discovery Space, but has its own name to distinguish it from Discovery Space’s focus on children 14 and younger. The name is based on how rivets connect things; leaders at Discovery Space hope that through The Rivet makerspace, they will connect people with similar interests and skills who can benefit by working together. Each Maker Monday program features a collection of maker activities, many free, and an optional activity that encourages attendees to meet someone new while they’re making something. 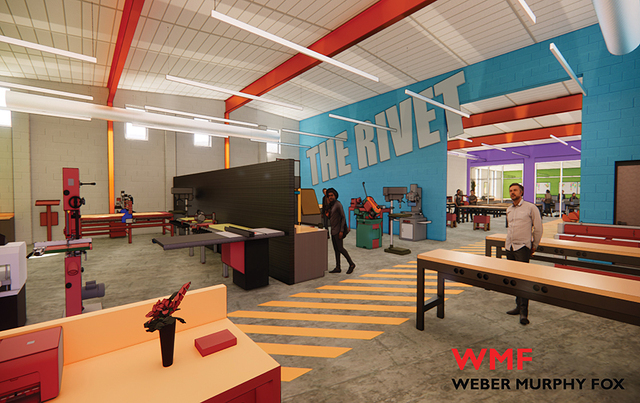 Once The Rivet is open later this year, teens and adults can take classes that teach a skill, such as welding or using a lathe, or that make a product, such as a coffee table or stained glass art, leaders say. “With the introduction of STEM throughout [the State College Area School District] this year, it’s going to be great to have a community workshop available for parents to step up alongside their children and have the opportunity to have ‘making things’ as a new family activity,” says Dan Chote, the father of two children in the school district. People who wish to access the space will be able to attend events, buy memberships to use the space, or attend classes. People are encouraged to bring their own materials when using the space, Sogin says. To learn more, attend a Maker Monday event (held every Monday, except April 22 and May 27, at 6 p.m.) or visit therivet.org.